Last we checked in with the folks at Greendale, Joel McHale et. al had effectively closed the door on the possibility of a Community season 7, but in keeping with the longstanding promise of “six seasons and a movie,” series creator Dan Harmon refuses to rule out the possibility of a feature film kicking into gear further down the line. Appearing on Monday’s episode of Larry King Now (via EW), Harmon conceded that he’s happy to see the likes of Joel McHale, Gillian Jacobs (Love), Yvette Nicole Brown and Donald Glover branch off into new projects, but holds on to that flicker of hope that he can get the band back together for a Community Movie. 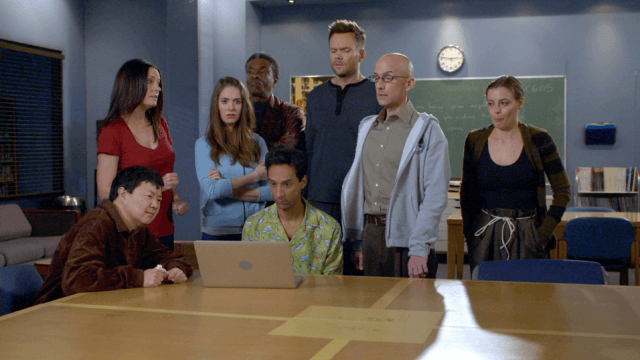 Community remains on ice for the time being, but do you think the prophecy of six seasons and a movie will hold true?